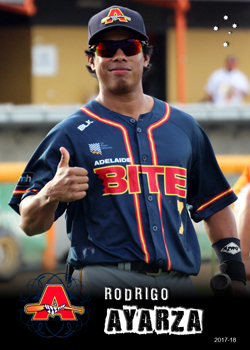 Ayarza is a Panamanian import from the Houston Astros organisation who played with the Adelaide Bite during the 2017-18 ABL season. Despite only being 22 years old at the start of the season, he had 7 years experience in the minors, 2 years in Dominican Summer League when he had been signed with the Texas Rangers, and the following 5 years with the Astros, both in Dominica and the US. He played with the Astros' Single and Advanced A affiliates in 2017, the Quad Cities River Bandits and the Bules Creek Astros respectively.